Technologies are growing enormously fast and their usage is becoming common in our day-to-day life as many of us are now started doing activities like shopping and paying online. This project is based on RFID technology that delivers couriers at the destination address and simultaneously updates the location of the parcel in the internet. The parcel is attached with a RFID tag that contains a unique number. These RFID tags are classified into two types: active tags and passive tags. The main advantage of RFID is that it can read multiple tags simultaneously, and does not even require a line of sight. These tags are able to be read even in the presence of substances like ice, snow and fog etc. In brief, these active tags are described as the tags powered by an internal battery to perform both read and write operations, i.e., the tag data can be written or modified according to the application requirements. In this project we are using passive RFID because they operate without requiring any separate external power source and thus obtain the operating power generated from the reader itself. These passive tags are read only tags and are programmed with a unique set of data. 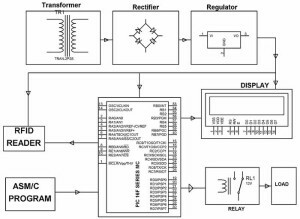 The block diagram consists of power supply, RFID reader, MAX232, crystal circuit, reset circuit, microcontroller and LCD display. 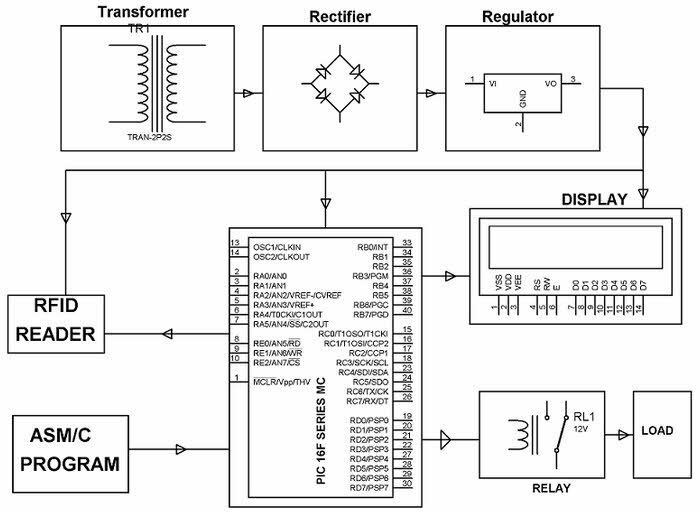 A Power supply block supplies electric power to entire circuit. 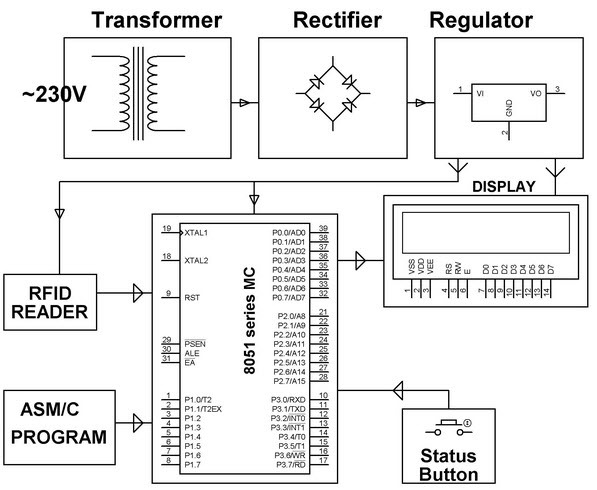 It converts AC supply of available electrical power to DC power suitable for this circuit range. 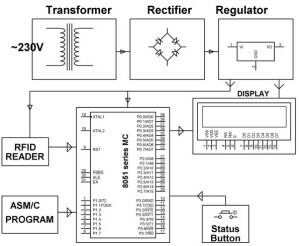 RFID reader reads the data and passes the data to the MAX 232, which then converts the data into TTL logic that can be understood by the microcontroller; therefore, the data is passed to the microcontroller. 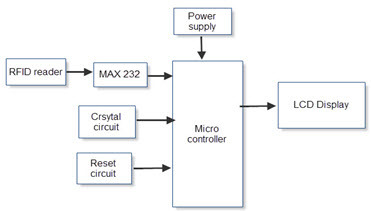 Crystal circuit sets the oscillating frequency for the microcontroller. 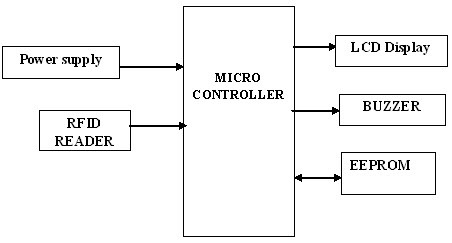 The microcontroller is programmed in such a way that it reads the unique number on the tag and displays the number on the LCD display along with the current area, in which it is in. Users can check the current location of the parcel in the internet. The controlling system automatically updates the location of the parcel in the internet as well as in the display. Apart from this parcel tracing system, some more projects are given below that are based on RFID system. The basic function of this attendance system is to keep a record of the employees whenever they report to and leave from work. The method of maintaining manual registers is time consuming and error prone as it takes lots of time to detect the errors and rectify them in the process of managing manual registers. This type of attendance system uses RFID technology making the complete system robust. 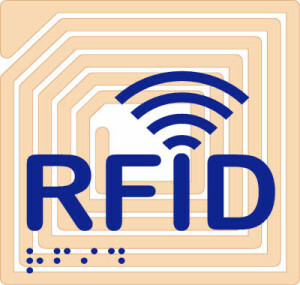 Employees are provided with an RFID tag that is embedded with a unique code such that the RFID reader reads the data and relays the information to the computer. This can also be implemented in colleges for student ID cards along with the RFID tags with unique codes so that students’ information can be stored in the microcontroller and can also be displayed on LCD display. Most of the colleges and universities’ libraries have implemented the RFID based library management system. This system collects the information about the list of books and documents so that the books can be quickly located in the library. Whenever a new book arrives in the library, an RFID tag containing the information like book number, name, publications, etc,is attached to it. In this system, every student has a smart card, and with that the student has membership in the library system. Whenever a student inserts a smart card in the smart card reader, the microcontroller authenticates this card with the pre-stored data of it, and gives a buzzing sound as a confirmation. 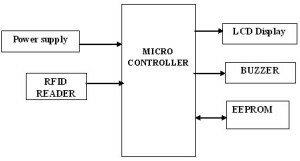 Therefore, whenever a student needs a book, the microcontroller reads the data of that book by an RFID reader. The microcontroller issues that book by storing the book details along with the smart card number in the external EEPROM – and while issuing the book, particular details get displayed on the LCD. Whenever a book is returned to the library, this system updates the information present in the EEPROM. In many of the industries some industrial areas belonging to some devices or machines or equipments must be controlled by authorized personnel, and therefore, are restricted for use from unauthorized persons. This project is intended to achieve this objective by ensuring control on various processes. In this system, the authorized persons are those who have RFID card that contains a unique ID corresponding to the individual’s details. Whenever this card is inserted in the RFID reader, the microcontroller checks this ID with a pre-stored ID. If these two IDs match, the microcontroller sends the signals to a relay such that a particular load will be switched. This information also gets displayed on the LCD display, and even shows unauthorized access or warning to the user. These are some of the RFID based projects that are widely implemented in several applications. We believe that, after going through all these projects, you would want to implement them all or any one of those by yourself. In that regard, if you want to comment, you can comment in the comments section given below.